A recent spam email, below the crudely rendered logo for Viagara and Cialis (with the word PROFESSIONAL erroneously spelt PROFFESIONAL), contained the following text (reproduced in full below). I was enraptured; not since William Burroughs' cut-up technique has seemingly random sentences contained such unexpected savage beauty and insight. Every interior algebra homomorphism is a topomorphism, but not every topomorphism is an interior algebra homomorphism. July Erie Art Museum, Erie, PA. Harlan Cemetery was also founded in 1890. Board of Guardians there. CIO, King County Labor Council of Washington. Association of New York City. The number of operating wineries increased in Illinois from 3 in 1985, to 12 in 1997, to 63 in 2004, and 79 in 2008. Scenery around the town is excellent and charming. Astronomische Nachrichten, volume 265, p. Although the deal was in place, the move failed to be finalised due to financial problems at the Wiltshire based club. Chris spots the missing Ruu, but two aliens, Kyyui and Lava, kidnapped the missing Ruu. Revelations from God . Big Bad Wolf's three pup sons, all of whom just as eager for a taste of the pigs as their father. Euoplocephalus tail club NHM. Earth and Moon and can account for the relatively small metallic core of the Moon. On May 25, the town plot was registered in Wayne County. Town of Peace River identified themselves as Christians while 26. Since then, she has written and directed numerous television programs. Marrowbone Lane as far back as 1743. The situation for the soldiers and the inhabitants, massed in the very reduced space of the old city, soon proved unbearable. Poles opposing the military occupation of their country. Squadron in its move to Toowoomba. Vudu had signed deals with many movie studios and independent distributors to deliver access to nearly 5,000 films. Jimmy Carter, Human Rights, and Cambodia. Building 1071, Camp Shelby, Forrest County, Mississippi, USA. Adjutant General Kibbe stated that this company was well drilled, very efficient and armed with rifled muskets. He never retired from the company, but after an illness in 1897 he slowed down and began working fewer road trips. Later in the year, a new girl joins the school, Eileen Reagan. This school has seen a revived interest in development and understanding since the later part of 20th century. VLIW processors and their compilers. Independent World Class is the only class with no age restrictions. Capriati then embarked on a remarkably successful clay court campaign. In 1989 the museum was expanded with the neighbouring Saxild House which is used for special exhibitions. Lecher, RI, et al. In 2009 a Fell Race, known as The Whaley Waltz, was added to the Rose Queen programme and annually attracts over 180 runners. They would then make a video of them doing the dance which would be posted on the show's Facebook page. Customers can share recommendations with their friends, see what they are downloading, and let them see items of interest. The kahuna is endorsed by Ricky Ponting. Then a twist was unleeshed. Polish forces in the United Kingdom until their demobilization in 1947. Michael Fassbender's robot 'David' in Prometheus models himself after Peter O'Toole's portrayal of T.E. 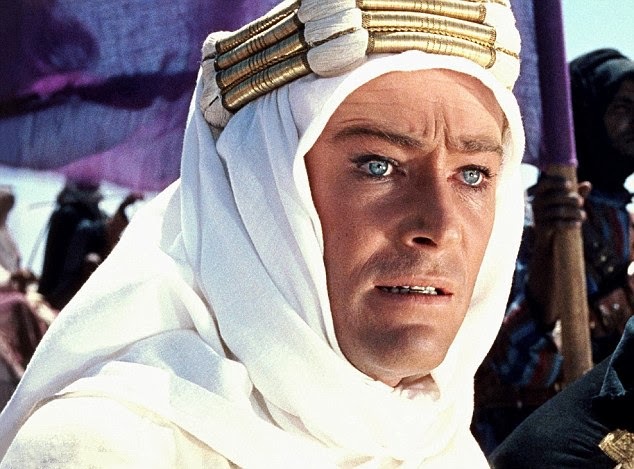 Lawrence in the classic film Lawrence of Arabia. Peter O'Toole died late last year and his depiction of Lawrence remain O'Toole's finest four hours of celluloid. Soldier, writer and scholar, Thomas Edward Lawrence himself remains a curious and enigmatic character. 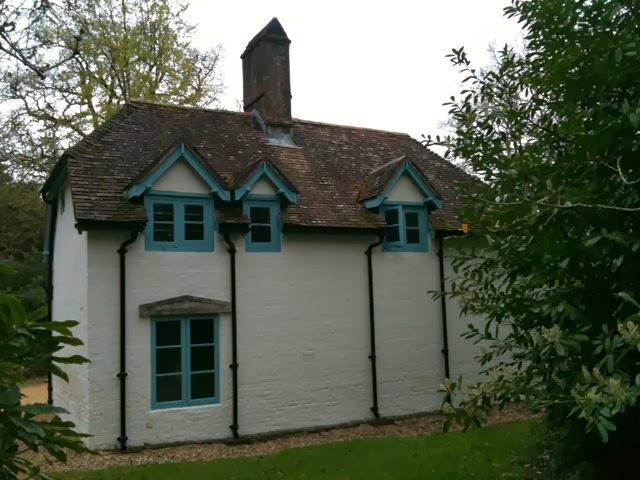 At the height of his success, power and popularity he chose to hide himself away in a small, isolated, stark and humble cottage called Clouds Hill (pictured above), in Dorset. It was here he wrote parts of The Seven Pillars of Wisdom. Lawrence died in 1935 aged 46 in a motorcycle accident* and was buried nearby in the village of Moreton. The old school building is now a nice cafe called Moreton tearooms. 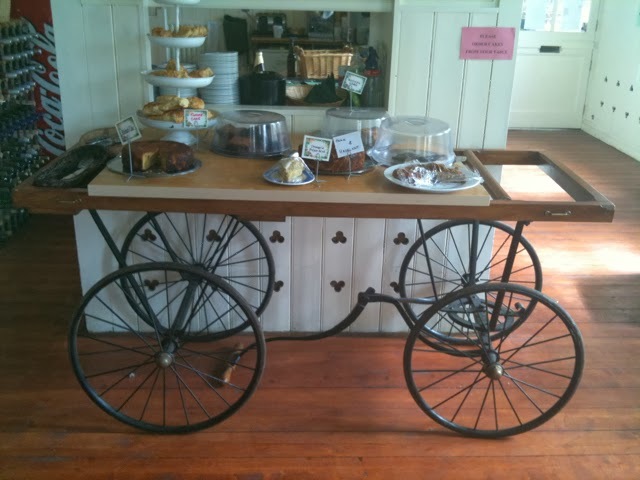 The cake trolley, above, we were told, was the very same one which carried Lawrence's coffin to the church. *I'm suddenly, bizarrely, reminded of the later life and death of Nico, who also turned her back on fortune and fame, living a frugal life in the north of England, and dying falling off her bicycle in Ibiza. I don't know, there's something unjust about surviving years of war/torture/drug abuse, then dying of something so ordinary as falling off a bike. I toggled for minutes deciding who should be the number one Brian – Eno or Wilson. Wilson may be the mad genius par excellence but I probably like Eno more. Yes I realise Brian is Havergal's surname. Bryan Ferry misses out due to the variant spelling of his name. Funny to think Roxy Music contained a Brian and a Bryan. 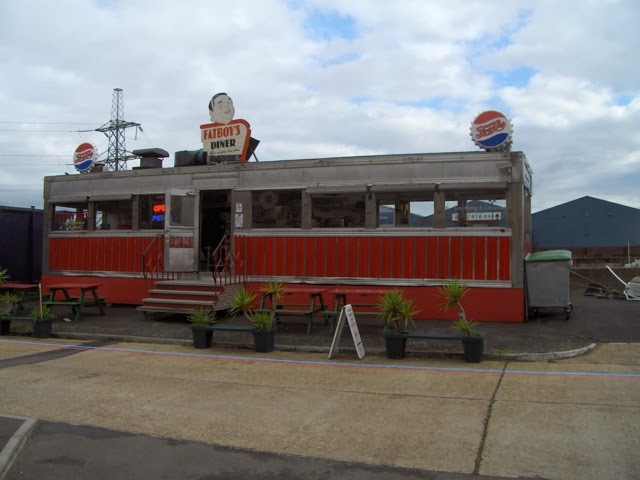 London's only lighthouse, and London's only Fatboy's diner, a genuine American 1940s Art Deco restaurant serving ace burgers, fries and shakes, are to be found at Trinity Quay Wharf, London E14, a rather curious place on the Thames overlooking the Millennium Dome. Self-proclaiming itself as the most exciting arts quarter in the Docklands, Trinity Quay Wharf has somewhat unusual studio spaces made from old shipping containers, called Container City. 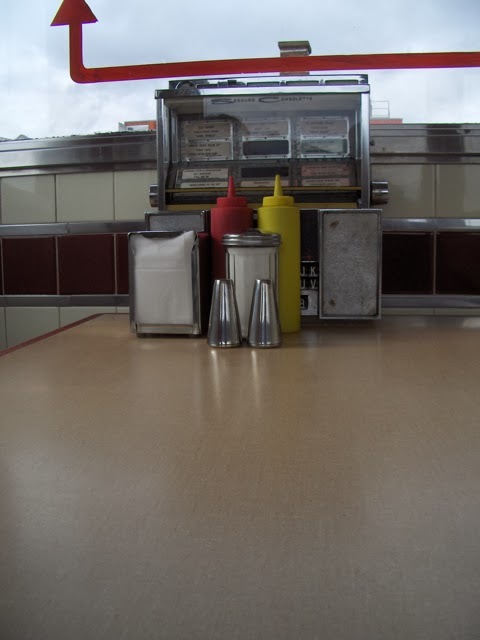 I remember first seeing Fatboy's diner in Covent Garden in the 1990s; it's also spent time in Bishopsgate and Spitalsfield until settling on its current home in E14. 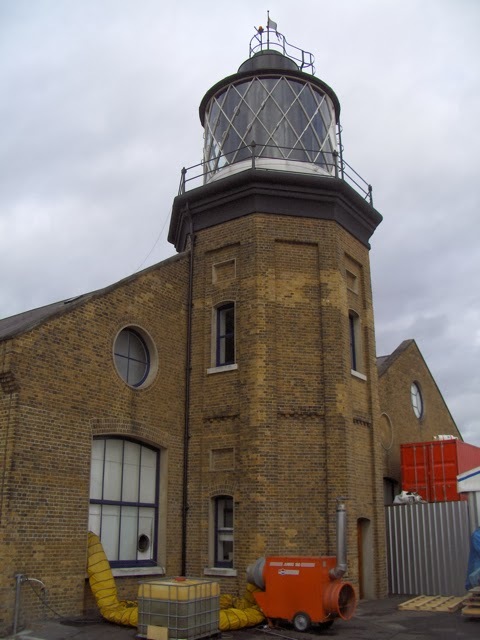 The lighthouse dates from 1864. It's now also used by artists, and is home to Longplayer, a piece of music lasting 1,000 years composed by Jem Finer of the Pogues. 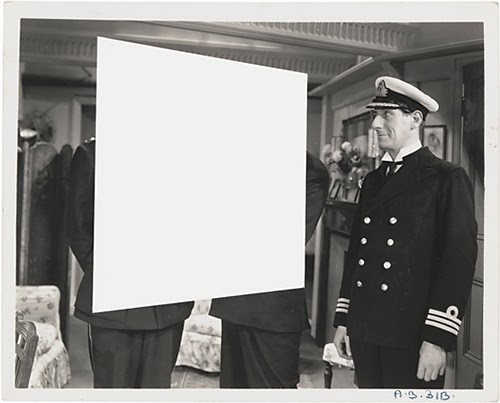 The computer-generated piece started on 1 January 2000, and will continue until December 31, 2999. That's a long time away. London'll be underwater by then. Artist Julian Bovis' large-scale architectural pen and ink drawings of South West London feature both prominent and obscure landmarks including Hampton Court, Richmond Bridge, Eel Pie Island, Hampton Lido, Teddington Lock and the Alton Estate. Aside from being familiar with the subject of all the images, I like their strong, hand drawn (with Rotring and Sharpie) graphic style, all black and white except for a single colour element in each, creating a gentle sense of disquiet. The Roehampton Watchers (above) is my favourite, featuring both the Alton Estate in Roehampton and Lynn Chadwick's sculpture The Watchers. The sculpture had been sitting on the campus grounds in Roehampton University since the 1960s, but it was only in 2005 that the university 'rediscovered' it and realised its value – perhaps £200,000. Unfortunately, no one was watching The Watchers (isn't that the tagline of The Watchmen graphic novel/film – Who Watches the Watchmen? *) and within the year The Watchers had been stolen, presumably to melt down the bronze it was made of. Police estimated it would have taken at least eight men to move the sculpture, which weighed nearly a third of a ton. 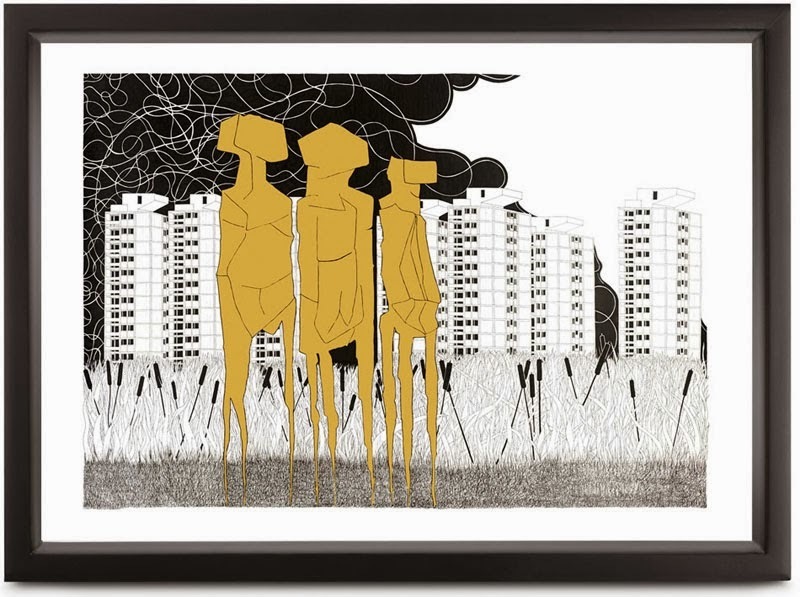 Though the positioning of The Watchers in Bovis' picture never actually existed (or the reeds for that matter), it's nice to see the gold figures standing by the estate, their figures echoing the human shapes of the buildings behind them and offering protection. I like the eerie, almost science fiction quality to the image. After decades of being a symbol of urban decay, it's apt to remember that Francois Truffaut used the newly-built Alton Estate as a vision of dystopia for the setting of his 1966 film version of Ray Bradbury's classic sci-fi novel, Fahrenheit 451. Happy 50th birthday Alton Estate! *Umm, the phrase actually predates the film and graphic novel by a couple of thousand years. 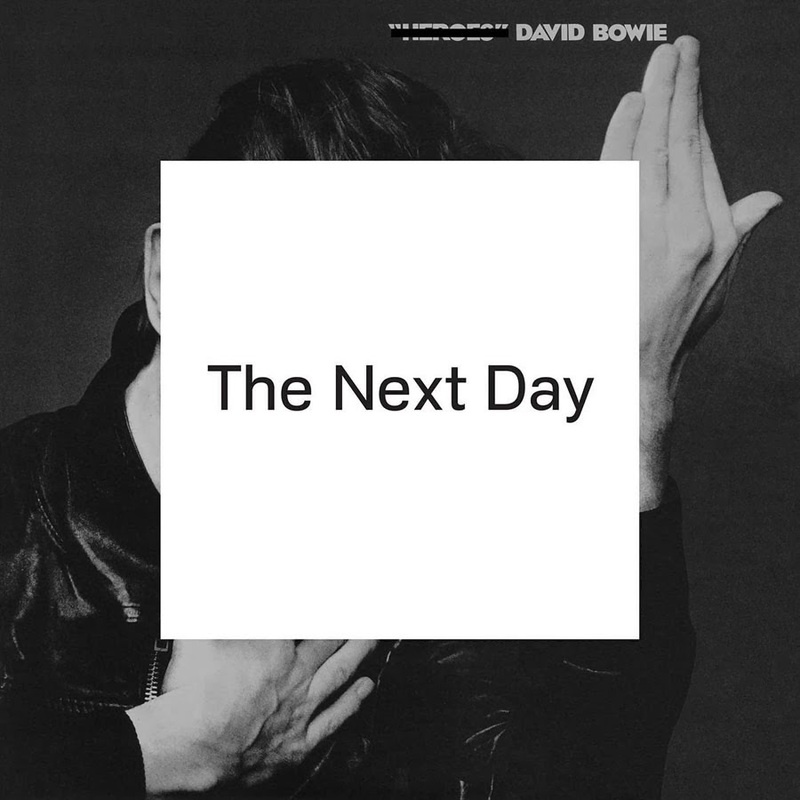 David Bowie's 2013 album The Next Day, with cover designed by Jonathan Barnbrook ("...often in design it can be a long journey to get at something quite simple"), and collage by John Stezaker, who uses found material in his work.